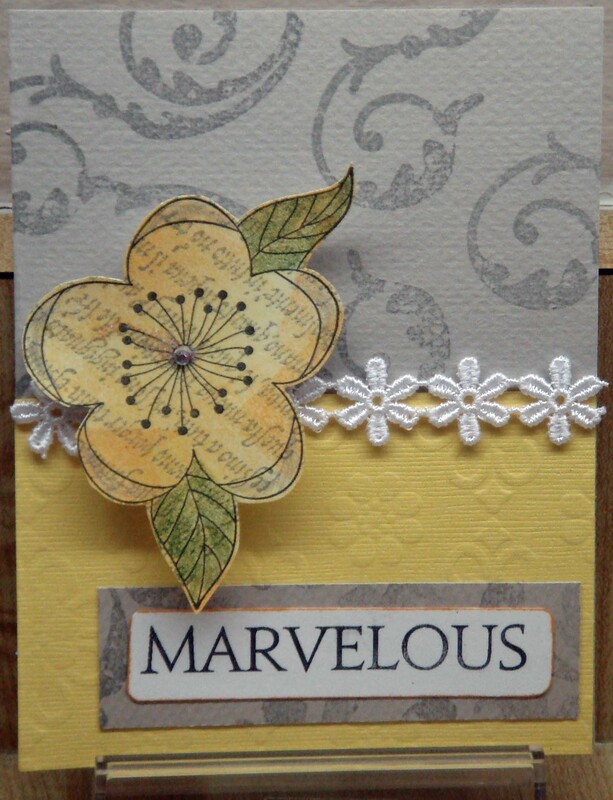 Fabulous Finds Friday — Bazzill App Giveaway! How exciting! My first blog candy to give out! And it’s pretty cool….. 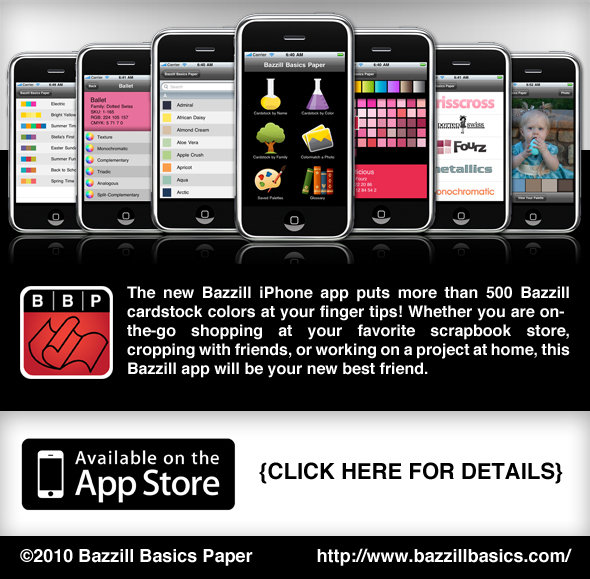 If you have an iPhone and you love Bazzill Basics paper, this is a deal made for you. This cool new app helps you mix and match Bazzill papers anywhere. Even if you don’t have Bazzill paper to match, you can get excellent color guidance … like a digital color wheel on your phone! And… drumroll…. I have an app for some lucky blog reader! Just leave a comment by Tuesday and my random selector will pull a name, to be announced Wednesday. Thanks for stopping by — and don’t forget to comment to win the app! Hello! I know, today is a FFF… and I got nuthin’! 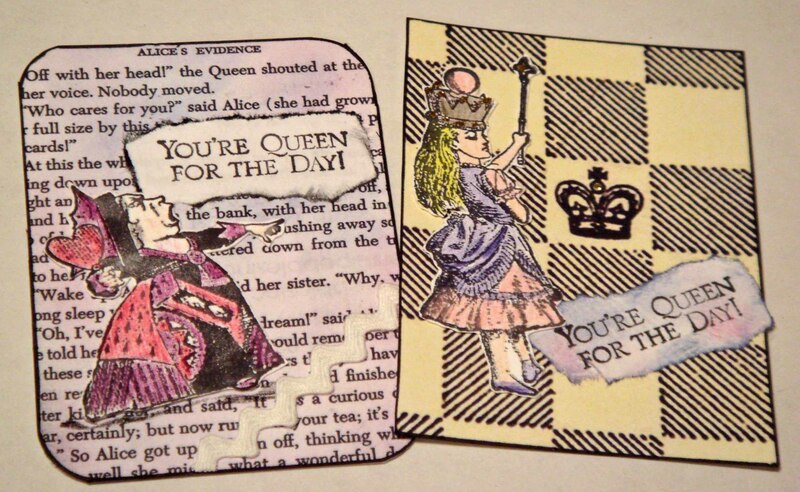 But (drumroll here) next week I will have my first blog give-away! (It will be a surprise for now… see the anticipation buiding?) Yay! 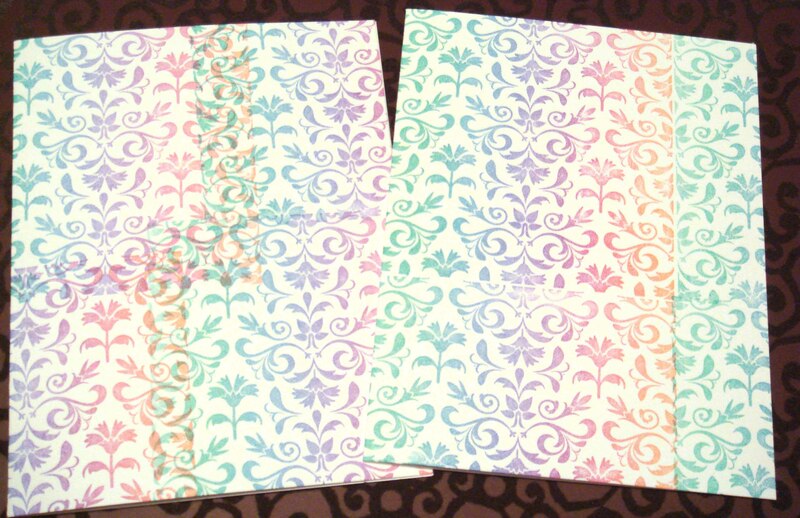 Using the same ink pad, I brayered a piece of scrap paper and white embossed the bird image (Crafty Individuals/Magenta), rounded the edges, then layered the image on black paper. 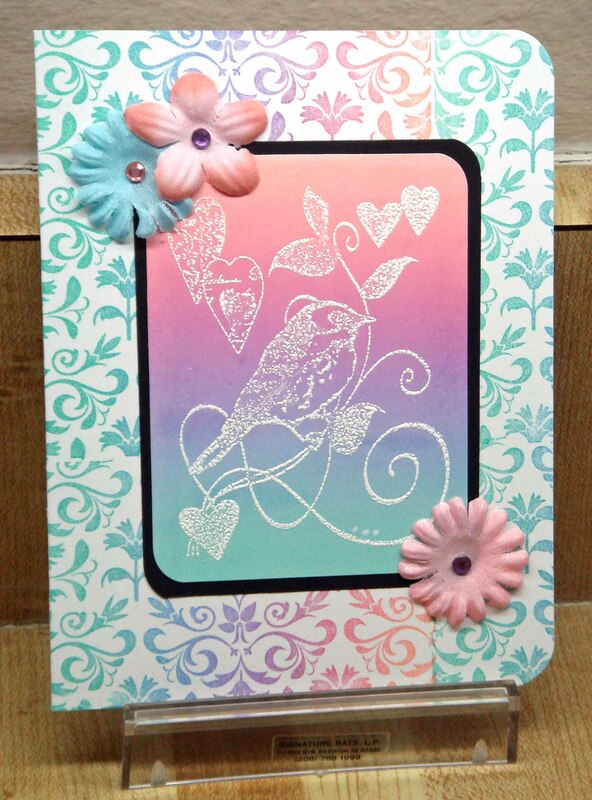 After gluing this on the card, I added some flowers (Imaginesce) and rhinestones, and rounded two corners of the card. Please come back next Friday for my first ever blog candy give-away! 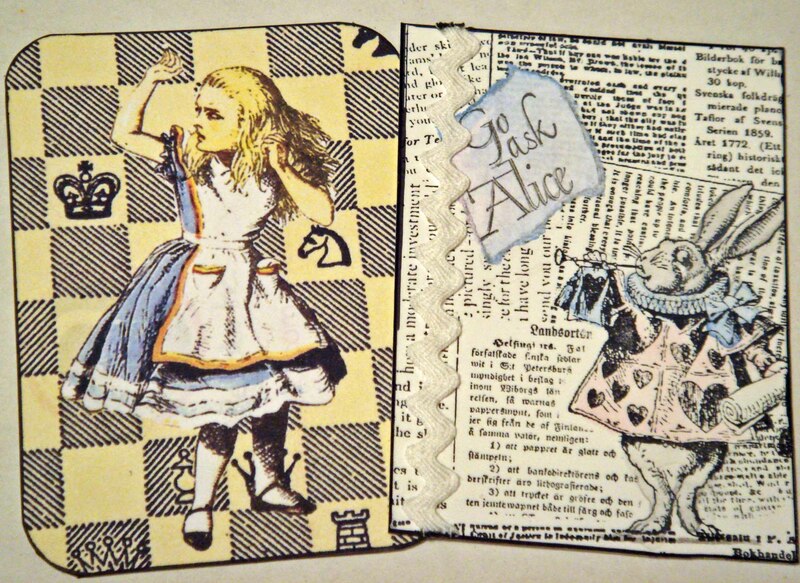 I made a set of ATCs using the papers and stamps. 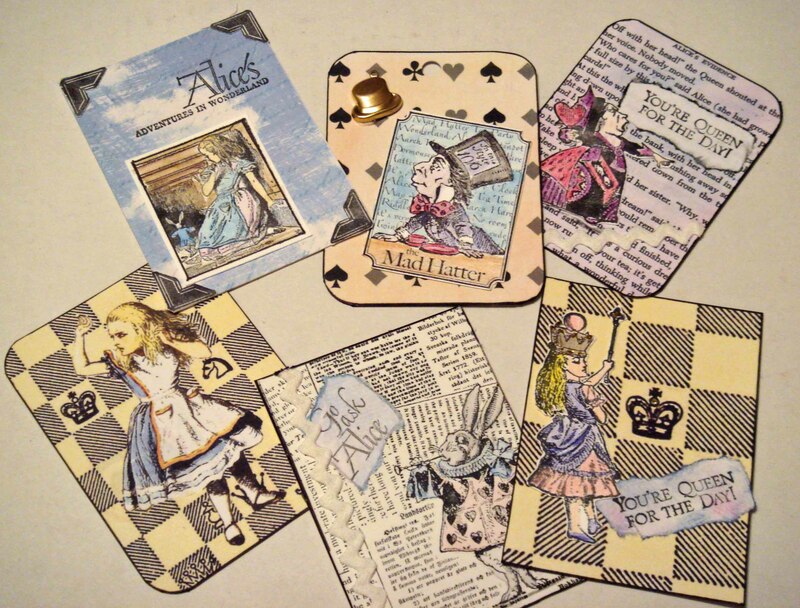 But I have decided to punch holes in the tops, turn them into gift tags, and give them to a friend who loves all things Alice. For more information, visit www.tweetyjill.com. I’m not normally a glittery-kind of gal. 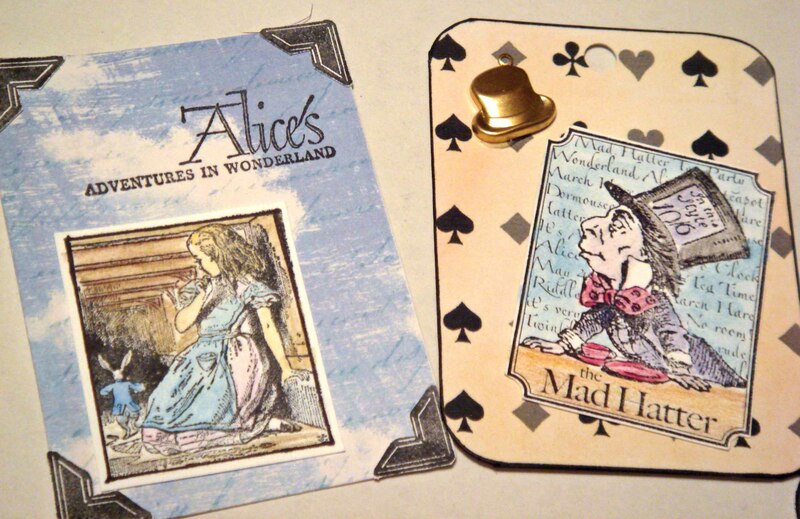 Oh, sure, I like my bling (give me rhinestones on my cards and I go wild!) but when I try to use glitter, I usually make such a mess. What attracts me to this glitter is the more subdued color. It’s not bright and brassy glitter, but a richly toned bling. The sample pack includes 14 colors. 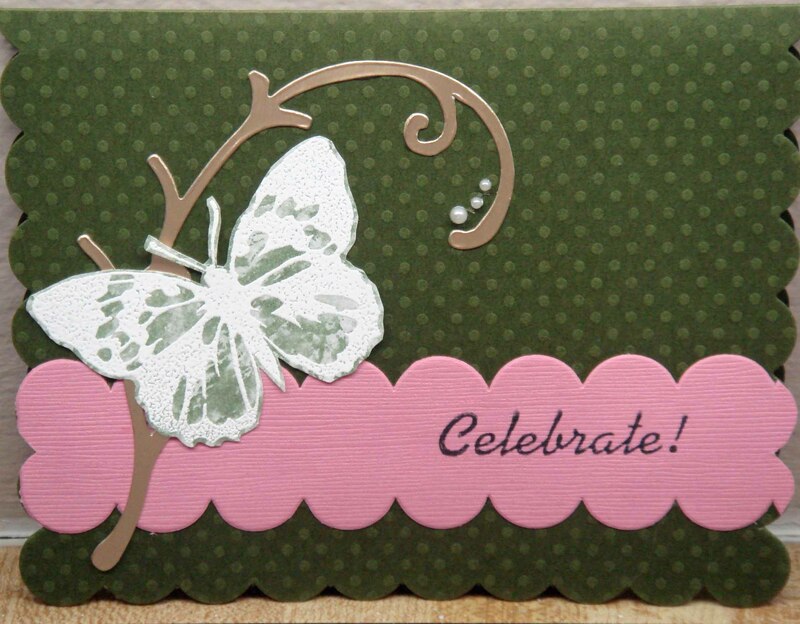 The Design Adhesives are so easy to use. They come on strips and you can use the entire strip or cut the pieces apart. 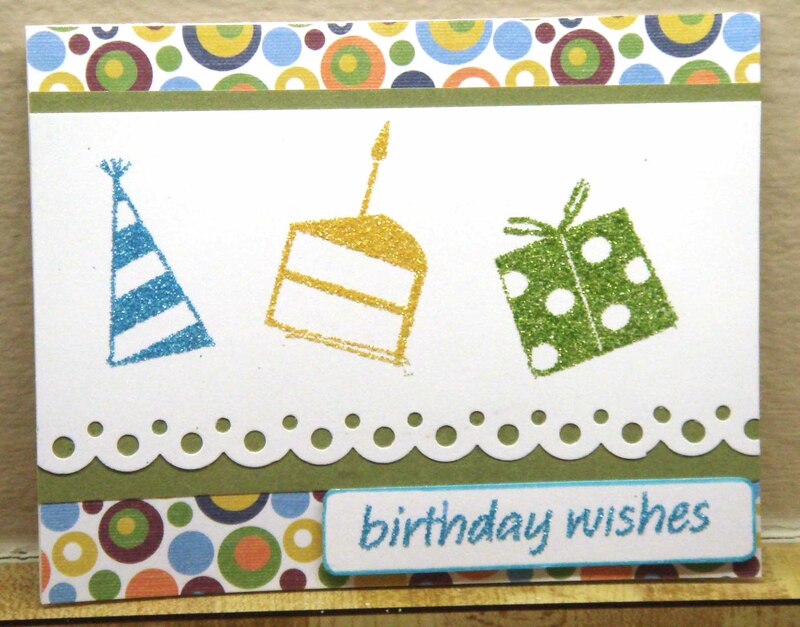 Then simply pull off the backing paper and place the design (adhesive side down) on your card or project. 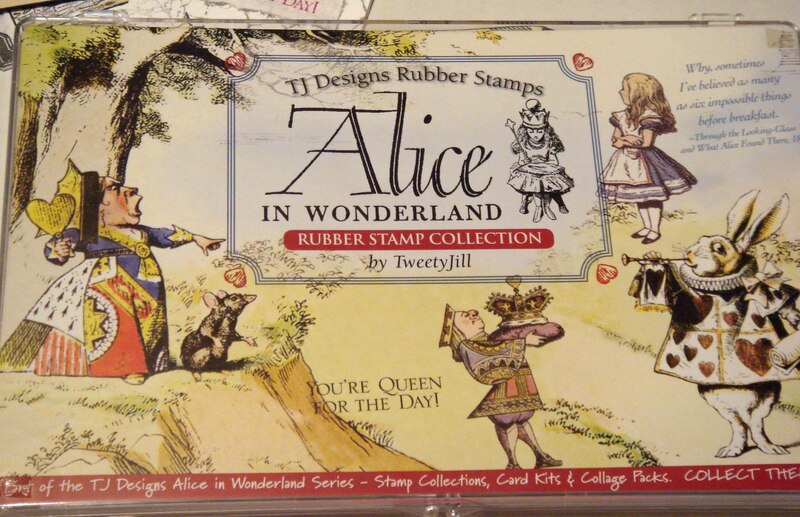 When you lift off the top sheet, there’s an adhesive design waiting to be glittered, foiled, leafed or embossed. Since I had the glitter out, I figured I may as well play a little. I happened to have a punched out piece of scrap paper on my desk (love when my messy desk turns up something useful!). 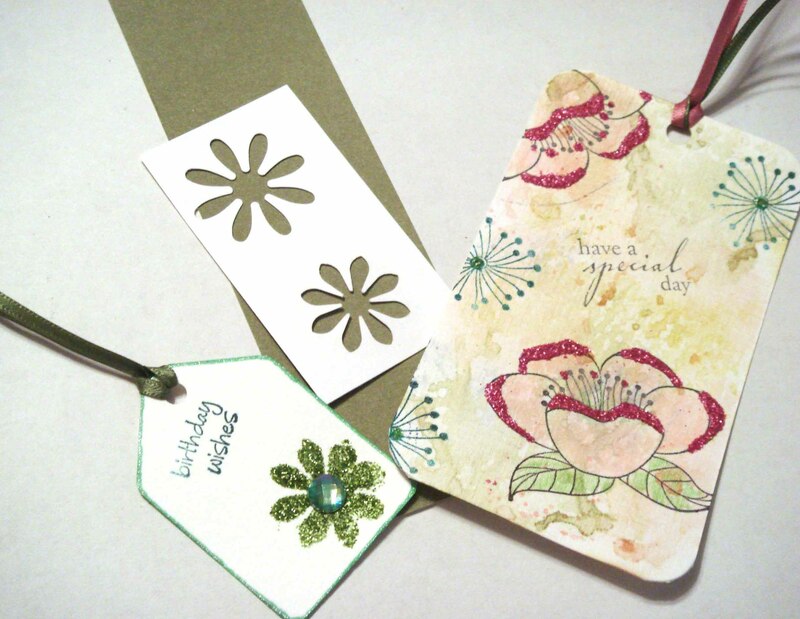 I grabbed a small tag, put the punched out scrap over it and spread a little white glue through the space. I carefully lifted the scrap and sprinkled glitter over the glue. When it was dry, I glued a rhinestone (also Sulyn) in the center, added a greeting (Hero Arts) and ribbon, then edged it (with a glitter marker from xxxx ) and I was done. 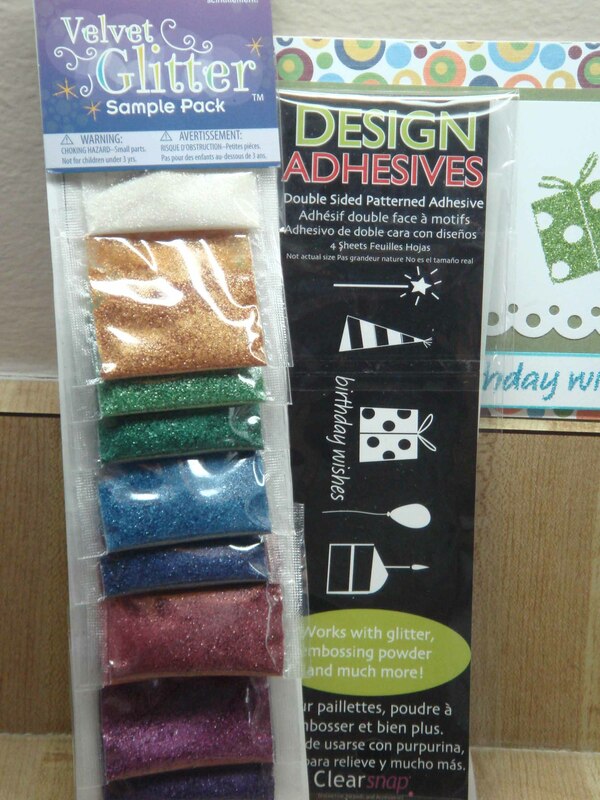 For more on the glitter and adhesives, check out: www.Sulyn.com and www.clearsnap.com. *disclaimer: the glitter and the adhesive strips were sent by the company.